So many unspoiled acres of heaven in and around the Point Reyes National Seashore, so little time. What to do first? Well, that depends. Everyone who comes here agrees – it’s a glorious place. Truly one of our country’s rarest natural gems. Breathtakingly beautiful, every single day of the year. But almost everyone we meet comes here for a different reason. Folks from the city come for a break. But that might mean touring an organic farm or enjoying a romantic meal at one of our renowned local restaurants. Or it might mean a day of hiking. But even the hikers are different. Some take it slow and easy, some want an all-day challenge. Same for the bikers. With 140 miles of trails, you just can’t know what kind of biking they’re going to be doing – or what they’ll be doing at the end of the day. All those different birders from around the world seem to want the same thing. The best damn spot for enjoying Great Egrets and Herons year-round. Hummingbirds in the gardens, kingfishers and owls out back. Like we said, it’s heaven. Kayakers seem to want it all. The great beaches only they know, the fabulous picnic spot, and a sweet bed to sack out in after a paddle. If there’s a roaring fire and a waiting pool table, all the better. Some folks come just to watch the whales spy on an elephant seal harem, or catch their first glimpse of a herd of tule elk. 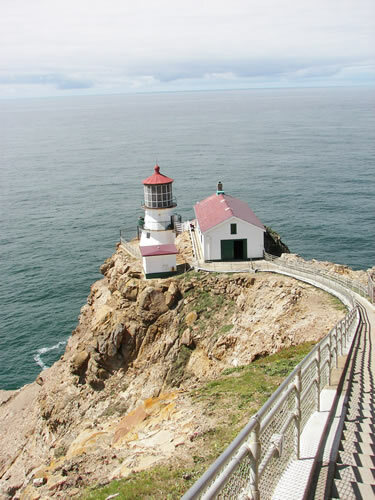 Others have always wanted to trek down the 308 steps to the lighthouse or simply stroll along our dynamic beaches. Sooner or later, they all end up here. You’ll meet some of them here in the Lodge. Each one will have had a perfect day – and each day will be different.